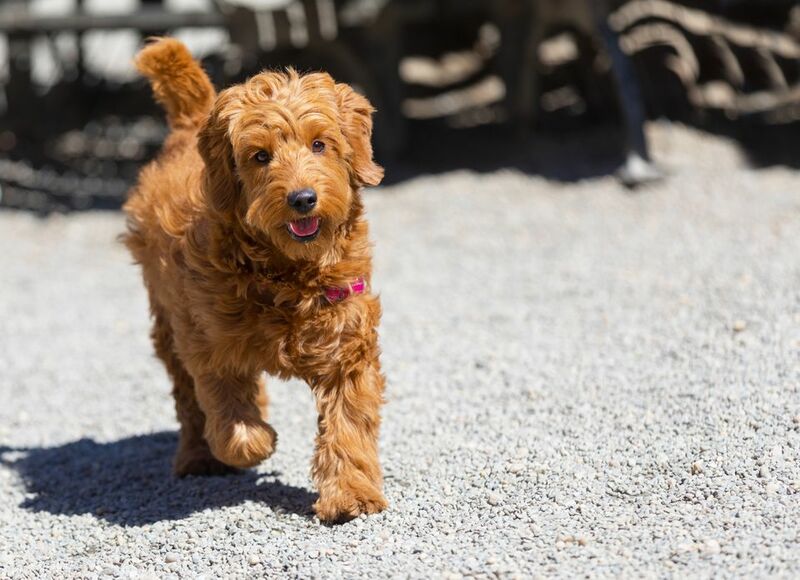 An adorable mix between the Golden Retriever and Poodle, Goldendoodles are the ultimate combination of good looks, smart wits, and playfulness. The hybrid is known as a “designer breed” because they were bred to have the lovable qualities of both of their parents. If their good looks don’t convince you to get one, their lovable personality will. Goldendoodles are a relatively new dog breed, first appearing in America in the 1990s. Their adorable name was coined in 1992. While not officially a registered breed of their own, Goldendoodles are considered a "designer breed" because each of their parents is a purebred, but different breeds from each other. Poodles don’t shed and are very athletic and intelligent, while Golden Retrievers are lovable and playful family dogs. The mix makes the Goldendoodle a great choice for a lifelong pal, especially for those with mild pet allergies. Got Allergies? Get a Goldendoodle! Some Goldendoodles are hypoallergenic and most don’t even shed, making them great for handlers with allergies, or those who want to avoid constantly picking up the vacuum. It is important to realize, however, that all dogs have dander (dead skin cells), saliva, and urine, where allergens exist, so there is no guarantee a Goldendoodle won't set off an allergic reaction. 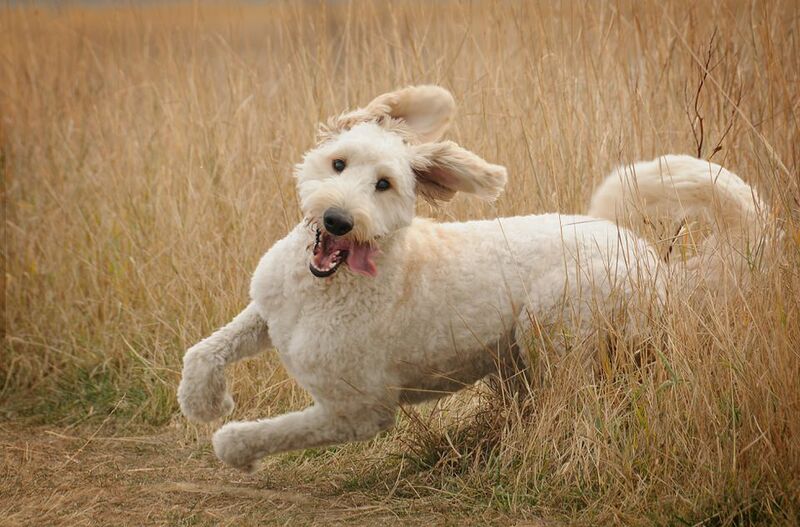 Energetic and playful, Goldendoodles love to exercise. They’re happy to laze around on the sofa (and they make great cuddle buddies), but agility is where they shine. These dogs are great companions for active families. Goldendoodles typically weigh between 50 and 100 pounds and love going on long walks, runs, and hikes with their owners. If you like bringing your pup along on outdoor adventures, consider the Goldendoodle for your next dog. If you imagine playing fetch and frisbee with your dog, then the Goldendoodle is an ideal choice. This breed loves to socialize and be near their owners; marry that with a penchant for playfulness, and you will have a buddy to enjoy plenty of time together in the park. Anyone who’s met a Goldendoodle can attest to their friendliness. They’re known to become fast friends with children, cats, and other dog breeds, making them an ideal dog for a family pet. In addition, those who prefer peace and quiet will love them; they often don’t even bark after a knock on the door. Although this doesn't make them the best watch dogs, their calm demeanor is part of what makes Goldendoodles so friendly. Poodles can be high maintenance in terms of grooming, but Goldendoodles keep it simple. They don’t need a lot of upkeep—a bath and a comb every two weeks will do the trick. Trimming their shaggy hair might be necessary once in a while, too. Most Goldendoodles have an instinctive love-love relationship with swimming, whether in a lake, at the beach, or in your backyard swimming pool. A great thing in the summer when the whole family is enjoying the outdoors, but you do need to be watchful at times—and stand clear when your Goldendoodle decides to shake off all that water. Goldendoodles' coats are a cute mix of their parent breeds’—it’s not nearly as curly as a Poodle’s, but is shaggier than a Golden Retriever’s. They can be orange, cream, dark brown, gray, or black in color. Some are even multiple colors. Not ready for the responsibility of a big dog? Luckily, there are miniature Goldendoodles, too. Instead of being bred with a Standard Poodle, Golden Retrievers are bred with a Toy Poodle to create a pint-sized pup. These mini Doodles may possibly be the cutest thing you'll ever see. The Poodle’s intelligence and Golden Retriever’s obedience makes this breed wonderful service animals. If you’re in need of a guide dog or therapy dog, look no further. They’re also great companion pets for hospital patients or people in nursing homes. For anyone needing a little cheering up, their happy demeanor will bring an instant smile to anyone's face. Goldendoodles are referred to by a few different names, all of which are cute and/or silly sounding. Groodles is one, while Doodles is another. This breed of dog is also sometimes referred to as the Goldenpoo.